Cole Phillips is as rugged a mountain man as they come. He and his mules take hikers, hunters and vacationers into the rugged Idaho wilderness, set up their camp and then leave until it's time to pack them out. He is a very private man and likes it that way....until he meets Maggie Childs. Maggie has invaded his wilderness and he doesn't want to trust her, but he can't stop thinking about her. She's smart, easy to look at and a darn good mule skinner. Right away Cole sees the danger of liking her too much but she haunts him every moment they are apart. The wilderness they both love is in peril of becoming cut up into a National Park. Cole and Maggie love the pristine mountains, the crystal creeks and rivers, and the solitude and peace of star-filled nights. ​The love of the wild Idaho mountains is enough to bring them together, but is it enough to keep them together on the wild side of love? "Ten Miles to Saturday Night"
Several years ago we were in Las Vegas for the National Finals Rodeo, I bought a CD of old time fiddle music. Listening to it, I could imagine the excitement of a country dance, a special get-together that eased the tedium of living the solitary life of a cowboy. The cover of the CD was a painting tiled "Ten Miles to Saturday Night" and that was all I needed to begin putting together a story with a hero who was a fiddler. Ten Miles is set in Wyoming in the 1880's, a time in American history when huge changes were taking place. The West was being settled, fences were going up, and railroad tracks were spreading like spider webs across the plains. Ten Miles is the story of success, hardship, lies, betrayal, and ever-lasting love, all wrapped up in a sweet romance that you can read, then pass on to your grandmother or your daughter. 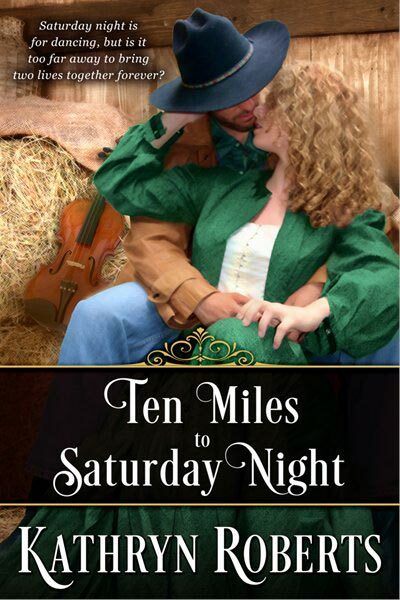 Ten Miles To Saturday Night is available as an e-book or in print, only on Amazon. "Ride into The Wild Side of Love"
Price: $7.77 & eligible for FREE Super Saver Shipping on orders over $25. Kathy Roberts lives in Placer County, California. Originally from South Dakota, she still loves the feel of the prairie and loves the wide open spaces. Kathy has been around horses all her life and has been involved in everything from 4H to High School Rodeo and is currently team roping with her husband, Elliott She coordinated the 4-H Horse program in Placer County for several years and was instrumental in creating the county’s Horsemanship Program.